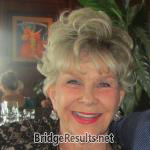 Kathy Wiggins and Glenda Vander Meer scored 0.94 masterpoints with a 56.21% game at In Tempo Bridge Club. See full results of this game. Richard McGowan and Suzanne May scored 0.84 masterpoints with a 58.33% game at In Tempo Bridge Club. See full results of this game. James Wareham and Dennis Weiland scored 0.39 masterpoints with a IMP game at Bridge On Shea. See full results of this game. Steve Ames and Dennis Weiland scored 0.58 masterpoints with a 53.27% game at Bridge On Shea. See full results of this game. Richard McGowan and Suzanne May scored 0.39 masterpoints with a 57.54% game at In Tempo Bridge Club. See full results of this game. Joan Ohre and Joel Glassman scored 0.51 masterpoints with a 57.29% game at In Tempo Bridge Club. See full results of this game. Richard McGowan and Suzanne May scored 0.17 masterpoints with a 54.26% game at In Tempo Bridge Club. See full results of this game. Richard McGowan and Suzanne May scored 0.28 masterpoints with a 51.19% game at In Tempo Bridge Club. See full results of this game. Joan Ohre and Bryan Carlson scored 0.90 masterpoints with a ★60.82%★ game at In Tempo Bridge Club. See full results of this game.